From the tropical beauty of Cayo's rolling hills and verdant rainforests to the sun-drenched beaches of its off-shore cayes (pronounced "keys"), Belize offers a rich variety of pleasure travel experiences within the confines of a small, friendly, English-speaking country on the Caribbean coast of Central America. For a nation the size of Massachusetts, with a population of only 240,000 people, Belize boasts some surprising superlatives, the best known of which is its offshore barrier reef, the longest in the Western Hemisphere. Its capital city, Belmopan, is the world's smallest with a population of 7,000, up sharply from 3,400 in 1985. And, Belize is proud of its Jaguar Preserve in the Mountain Pine Ridge, the only jaguar preserve in the world. In its role as a pleasure travel destination, Belize has two distinct faces: its coconut palm-studded off-shore cayes strung out along the barrier reef with a multitude of Caribbean beach resort hotels, and its Central American mainland replete with ancient Mayan ruins, jungle hideaways, and magnificent virgin rainforest. 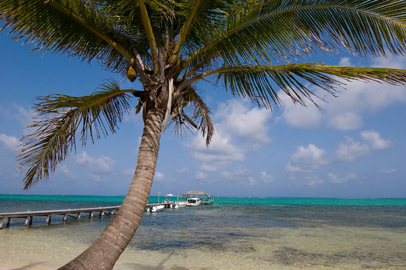 Ambergris Caye is the largest of the offshore cayes and the center of tourism. Visitors arriving at the International Airport in Belize City can load their luggage aboard a 12-seat aircraft and land in San Pedro village on Ambergris Caye 20 minutes later. Here, they'll be ready to enjoy all the pleasures of a Caribbean beach resort with emphasis on undersea diving along the barrier reef and feasting on the indigenous conch, lobster and other seafood. The best weather and high season for visiting the Caye is November through March/April. Accommodations in San Pedro range from inexpensive to luxurious. Victoria House, located on the beach just south of the village, offers a quiet atmosphere, a choice of beachfront casitas or rooms in the inn, and three excellent meals daily, at rates ranging from $115 to $140 per couple. Boats call frequently at the Victoria House dock to pick up divers enroute to the barrier reef. San Pedro village features shopping and some exciting nightlife. For Americans, mainland Belize is perhaps best described as a frontier environment. The best time of year to visit the Belize mainland is February/March through June. Belize City is the commercial hub of the country, but its congestion and street crime limit its attraction for tourists. Belmopan, Belize's capital city, is a unique town in the Cayo District about an hour's drive west of Belize City on the Western Highway. In addition to its government offices, Belmopan has a thriving Market Square where one can buy anything from fruits and vegetables to western hats and souvenirs. There are banks, restaurants and hotel accommodations. The Bull Frog Inn has been the premier hotel in Belmopan for the past decade, offering spacious rooms with private baths and American television for about $65/night. The inn's restaurant features native Belizean cuisine at very reasonable prices of $9-10 per person, and a Salvadoran string band plays on Thursday evenings. One of the most interesting lodges in Belize is Banana Bank, a 4,000-acre ranch operated by John and Carolyn Carr, Americans from Montana and Kansas, respectively. The lodge is accessible via a road off the Western Highway opposite Belmopan terminating at the Belize River, where John will pick you up in a small boat. Banana Bank is home to an orphaned jaguar, scarlet macaws, and a female howler monkey whose wild suitors call to her from the surrounding jungle. There is a guided Belize River trip conducted by John, horseback riding at all skill levels, and plenty of room to roam around the ranch. Rates start at $59 for a lodge room and $89 to $119 for a cWTAna, including breakfast. Continuing west on the Western Highway from Belmopan, one passes one village after another with names like Roaring Creek, Tea Kettle Village, and Black Man Eddy, finally arriving after 45 minutes at San Ignacio, the commercial center of the Cayo District, on the banks of the Macal River. If you plan to stay in the area, San Ignacio Hotel sits high above the surrounding terrain, providing scenic views of the tropical vegetation below. Rooms start at $90 per night. If you're not spending the night, lunch on the balcony provides an opportunity to take in the view while enjoying a leisurely repast. Lunch will run you about $5-6 per person, and dinner about $12. Benque Viejo is the terminus of Belize's Western Highway, about 15 miles beyond San Ignacio at the Guatemalan boarder. Benque, like San Ignacio, is built into the ancient hills where the Mayans once prevailed and Xunantunich, a Mayan temple, is one of several Mayan ruins in Belize which are open to the public. Spanish architecture is prevalent in Benque and the Catholic church there is particularly picturesque. About two hours beyond the border in the Peten Province of Guatemala stands Tikal, perhaps the largest of the ancient Mayan cities which spreads across what are now Mexico, Guatemala, Honduras, and Belize on the "Ruta Maya." On the return trip from the Guatemalan border, a left turn at Central Farm will take you to a ferry crossing of the Belize River, a memorable experience in itself. On the other side of the river is Spanish Lookout, the largest of several Mennonite colonies in Belize. The Mennonites are responsible for most of the commercial agriculture in Belize. Reflecting this, Spanish Lookout is a very picturesque community of small farms with virtually every staple of food and hardware available at the "FTC", the Farmer's Trading Center. The architecture is reminiscent of the Amish country of eastern Pennsylvania, but the folks here are much more liberal, using all of the latest consumer electronics, flashy motorcycles and vehicle cell phones. The local smorgasbord offers all you can eat for $5 and it's more than worth the price. South of Belmopan the Hummingbird Highway takes you to the towns of Dangriga (Stann Creek), Placentia, the only beach resort on the mainland, Punta Gorda, and Toledo, the center of present-day Mayan culture in Belize. The Northern Highway takes travelers north from Belize City to the towns of Orange Walk and Corozal, a scenic seaside community just south of Santa Elena, the gateway town for visitors entering Belize from Mexico. For more information about Belize, call the Belize Tourist Board at 800-624-0686 from the U.S. or Canada, or visit its website at www.travelbelize.org. Notice: This information is current as of March 2001. It is recommended that you contact the numbers, and/or visit the websites above to determine any changes to the information. BELIZE CITY, Belize, June 23, 2005 -- When visitors fly into Belize's Philip Goldson International Airport or disembark from a cruise ship, they find themselves in Belize City, the largest city and the point of connection to virtually everywhere else in the country. Now, two of the city's newest attractions allow tourists to discover Belize's rich history, breathtaking scenery and diverse cultural landscape. Located in the heart of Belize, Belize City is the country's social and economic hub, alive with color, culture and welcoming to visitors. Belize is the only English-speaking country in Central America and prominently displays its British roots throughout the country. The genteel colonial charm, mixed with the modern day influences from Belize's other cultural groups, including the Maya, Creole and Garifuna (African Caribes), is resonant throughout the streets of Belize City. Old Belize is the newly built cultural and historical center designed for visitors to experience the charm of Belize in one visit. The center highlights the major ethnic groups, the industries that contributed significantly to Belize's economic development, and eco landscapes for which Belize is world renown. Guests of Old Belize will enjoy a 45-minute, entertaining tour which will take them back in time to travel through realistic, life-size re-creations of lush rainforests, dark caverns, towering Mayan temples and steam-powered saw and sugar mills. The interactive exhibits ensure that visitors experience the sites, sounds and even tastes of Belize including the scent of the rainforest, the beating of the Garifuna drums and the sampling of the fruit of the Chicle tree. Old Belize is located along the shoreline of the picturesque Cucumber Beach Marina and boasts the only sandy beach within city limits. Here, visitors are invited to relax and sunbathe, or sit under a thatched palapa, sipping one of the many fruity drinks from special recipes. For those looking for a delicious meal in a casual, tropical atmosphere, Old Belize's on-site restaurant, the Sibun Bite Bar offers a full menu of flavorful Caribbean dishes and local specialties. Admission to Old Belize is $15 for adults and $10 for children ages 6 - 12. For more information, visit the Web site at http://www.oldbelize.com/. Belize City now offers visitors the opportunity to enjoy an intimate look at the city's culture, history, landscape and diversity through intimate horse-drawn carriage tours. Some of the tour's must-see sights include visits to the famous swing bridge - the world's only operating hand-cranked bridge- and St. John's Cathedral, the oldest Anglican Church in Central America that was built in 1812. This fresh-air tour also takes participants past the city's beautifully restored colonial mansions, the House of Culture and the historic Government House, which has hosted such royalty as Queen Elizabeth II. The tour concludes with shopping downtown with stops at the local chocolate factory and floral studio. The tours last for approximately one hour but guests have the option of extending their trip for an additional hour to visit one of the museums located in the city such as the newly constructed Old Belize and Cucumber Beach. The price for a full tour is $20 and toddlers can ride for free. Tours must be booked in advanced to reserve a seat. Overnight visitors are advised to reserve space at least one day in advance while cruise ship passengers are urged to give two weeks advanced notice. For more information or to make a reservation, contact belizehorsecarriagetours@yahoo.com or call(+011) 501-602-3048. Whether you choose a visit to Old Belize or an intimate carriage tour, both are wonderful introductions for travelers entering the country. The history, culture and charm of the tours are an ideal attraction for travelers or cruise passengers looking for an interesting and fun afternoon activity. Other must-see attractions in Belize City include the newly renovated Bliss Center for Performing Arts. Located in the Southern Foreshore area, this elegantly furnished theater is the first of its kind in Belize and regularly houses music, drama, and dance performances, as well as the Institute of Creative Arts and the Belize Art Gallery. Also, the Museum of Belize, the country's first national museum, and the Maritime Museum, which is home to a remarkable collection of Belize's marine heritage, are both great attractions for those looking for educational experiences. Last, but certainly not least, is the Image Factory Art Gallery, featuring the largest collection of Belizean art in the country, and staging exhibitions of art, history, culture, and sculpture. Snuggled between Mexico to the north and Guatemala to the west and south, relaxed, English-speaking Belize is only a two-hour plane ride from the continental U.S. Adventure into a land rich in natural beauty and steeped in the magic of its Maya past. Renowned for pristine waters, exotic marine and wildlife, lush, unspoiled landscapes, and superb diving, Belize is truly Mother Nature's Best Kept Secret.